FILE - A doping control official attends the women's semifinal ice hockey game played by Canada vs the Olympic Athletes from Russia, Feb. 19, 2018, at the Pyeongchang 2018 Winter Olympics in Gangneung, South Korea. FILE - Russia's Sports Minister Pavel Kolobkov addresses the media in Moscow, Feb. 1, 2018. 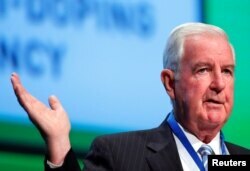 Craig Reedie, president of the World Anti-Doping Agency (WADA) attends the WADA Symposium in Ecublens, Switzerland, March 21, 2018.